The victory Los Angeles teachers and their union, United Teachers of Los Angeles (UTLA), won in their contract fight with Los Angeles Unified School District (LAUSD) has the potential to change the world, as the Chicago Teachers Union did in its landmark 2012 strike. Their path-breaking struggles are reverberating in the latest wave of walkouts and strike votes spreading across the nation’s school systems — and the school year is barely half-over. Los Angeles teachers rode the tide created by the teacher walkouts in “red states,” which taught labor the power of direct action to win demands from the GOP’s elected handmaidens to wealthy elites. By consciously using community organizing and reinvigorating the union’s internal structures to mobilize members, UTLA created a social movement so powerful it forced LAUSD and the corporate titans who control the city’s school board to make concessions. The strike demonstrated to teachers unions throughout the world that they can win against the global education reform movement. UTLA has created hope and breathing space for struggles for public education in the global North as well as the South, with governments in thrall to transnational corporations and international finance organizations controlled by the United States. This strike was a defeat not only for Superintendent Beutner, given his job by Los Angeles “vulture philanthropists” like Eli Broad,” but also for their global project. While the goal of creating “choice” has been exposed as a cover to “marketize” education for profits, another less-discussed aim is to control what students are taught so as to mold the new workforce. Both relate to corporate elites’ plan to eliminate jobs on a scale never seen before. The project’s elements have been set out clearly: downsizing public higher education; defunding K-12 schools; narrowing what is taught with testing; pushing out working-class students of color with punitive disciplinary policies. UTLA’s strike has shown we can successfully resist this project. With this victory, UTLA raises the bar for resistance, making space for activists to grapple with well-known harmful reforms as well as little-understood but dangerous new policies — accepted in many cases by the national teachers unions — that intensify control over learning and education’s marketization. Silicon Valley has teamed up with investment banks to use students’ data as a new form of human capital. Community schools activists have pushed as an alternative to charters, to provide a full array of social services to students, are frequently implemented by school districts with outsourced services funded by social impact bonds, which pay companies to eliminate students from services for which they are legally eligible, and expanded collection of student data. Strikes like LA’s can push back against these policies. Much won wasn’t in the contract. Teachers feel empowered, and the debate around charter schools and funding public education has shifted. Solidarity was built across schools, and teachers won dignity and respect for their work and profession. Though gender remains an implicit rather than explicit part of the new militancy among teachers, there is no ignoring how teachers’ willingness to speak truth to power has been fueled by their explicit expression of love of working with and for kids. The strike is a feminist victory, highlighting the power of workers who do “women’s work” outside the home, the paid labor of reproduction. Their struggle supports developing vibrant, generative theories of social reproduction in capitalism — a task that should be high on socialists’ agenda. Key members of UTLA’s “Union Power” team were skilled community organizers before they became union leaders. Their acuity and commitments to social justice and equality, informed by successful organizing, showed in their laserlike focus on building mutually respective alliances with communities of color. Their outreach to win support of African-American teachers and community, the trust built with immigrant families and activists, and their work with students have mediated the mistrust and anger activists and parents can feel about the reality of unequal conditions in our nation’s schools.One teacher active in working against the school-to-prison pipeline told me that while UTLA had not yet halted “LAUSD’s racist daily random weapons search policy,” in freeing some schools from this policy, it has taken a major step. The victory resulted from UTLA’s involvement with Making Black Lives Matter in Schools, participation with Black Lives Matter LA, and organizers, members and attorneys involved in the Students Not Suspects Coalition. The pushback on punitive punishments of students of color is a singular accomplishment, a model for teachers unions elsewhere that are attempting to build broad coalitions to defend public education. Funders of “choice” have paid huge sums to stoke outrage at teachers unions for opposing vouchers and charter schools, but the unions themselves have abetted this by refusing to name racism and austerity as a problem in which they and organized labor have been complicit. Modest support for the strike by contenders for the Democrats’ 2020 presidential nomination, including LA Mayor Eric Garcetti, and other segments of the Democratic Party should be seen in light of their past refusal to reject the bipartisan rapture for privatization and austerity. Only the “far left,” as pundits refer to them, like Bernie Sanders and Alexandria Ocasio-Cortez, aligned themselves with UTLA’s sharp critique of the billionaires’ effort to defund and destroy public education. In returning to their classrooms, UTLA members along with community supporters and students are making sense of what the contract means in practice for them and LAUSD. Expectations were very high from members as well as community supporters, who were involved from the beginning in formulating contract demands. In a remarkably refreshing display of transparency, UTLA’s officers issued a statement with the tentative agreement asking for comment on the process and laying out the choices as they saw them. Union contracts are limited in effecting change in classrooms because the scope of bargaining is limited by law. Even what seem to be clear contract wins will be protected and enacted (or not) chapter by chapter, even class by class, with support from the central union and staff. Class size caps remain a huge issue for teachers and parents. The contract eliminates the administration’s prerogative to override its own class size maximums, which is a major win; at the same time, class size itself has not been substantially reduced. But the struggle over class size is part of a thornier challenge: how teachers will actually alter power relations in the schools, building on the organizing that occurred in preparation for the strike and the experience of the strike itself. Although there was nothing in this contract about teacher evaluations, UTLA, like other teachers unions, needs to take up this fight. The Right’s assault on teachers and teachers unions has eroded, when not eliminating entirely, elemental protections for teachers in the evaluation process. Though the strike has pushed back on principals’ power, the contract contains nothing explicit to halt teachers’ victimization in unjust, arbitrary evaluations. Teachers have died from the stress of fighting against punitive assessments, and many professional careers have been destroyed. Any teacher, no matter how brilliant or dedicated, can be victimized, as union contracts and state law are weak in protecting due process for teachers accused of poor performance. Defending the contract can mean risking the loss of one’s job in many city schools. Teeth in the contract and state law for teaching assessments that are impartial protects academic freedom as well as the union’s power. Teachers’ power is built at first by small groups of activists whose resources are strained. Doing union work — or in many cases, the work the unions should do but don’t — comes on top of the stressful, labor-intensive work of teaching. Though an effort was made in UTLA to develop a real caucus, as was done in Chicago, it fizzled, as longtime activists acknowledged privately. Union Power is a leadership team, composed of key officers who work effectively together as representatives of the union. In contrast, a rank-and-file caucus is open to all members who agree with its program. The caucus elects its officers and votes on who will stand for election. Union Power’s cadre was stretched thin after the election, and key activists either stepped into official roles or shifted their energy to work with students and community on urgent social justice needs like protecting students from deportations and fighting against prison-like conditions in schools. The smart, dedicated officers in Union Power deserved and needed a genuine rank-and-file caucus. The pushback and feedback a caucus provides is irreplaceable; it is the spine of union democracy. A caucus may well have persuaded union officers and the bargaining team to delay settling the strike, having a robust, well-informed debate on the tentative agreement, of the kind that Chicago teachers held at the end of their 2012 strike, when they voted to extend the strike an extra two days to read and debate the contract’s contents. Still, the strike in Los Angeles is an enormous victory. 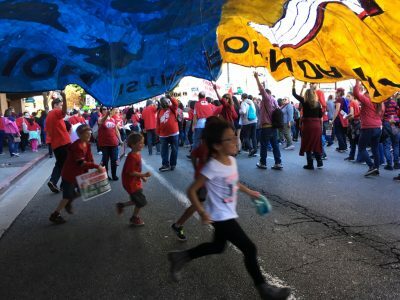 In its wake, teacher walkouts are gathering force again in states like West Virginia where they occurred last spring, demonstrating that teachers and transformed unions are the organizers of a vast social movement defending public education, the public sector, and the dignity of work. LA’s lesson to other unions: you, too, can become a social movement. This is how it’s done.